On the outside of the converted Chinatown warehouse that houses Beyond the Streets, a massive poster by the feminist art collective Guerrilla Girls has been installed. In bold letters on a bright red background it reads, “Don’t let museums reduce art to the small number of artists who have won a popularity contest among big-time dealers, curators, and collectors. 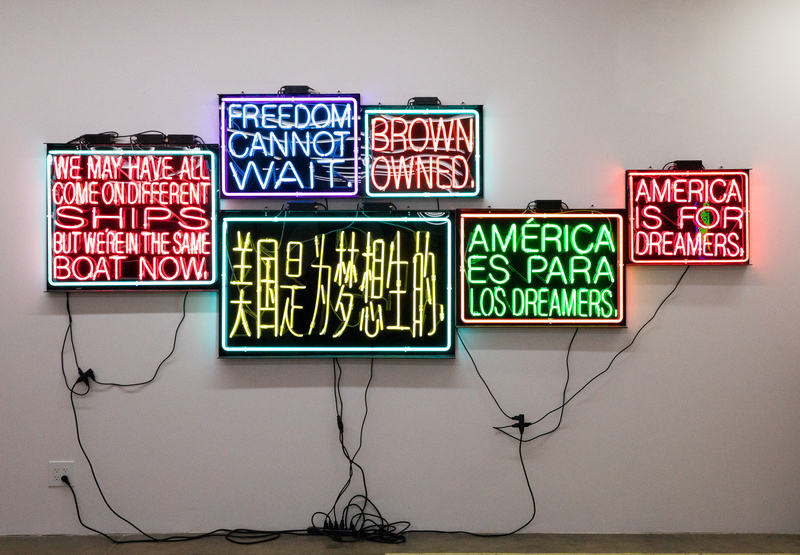 If museums don’t show art as diverse as the cultures they claim to represent, tell them they’re not showing the history of art, they are just preserving the history of wealth and power.” The piece might as well be a mission statement for the show inside. 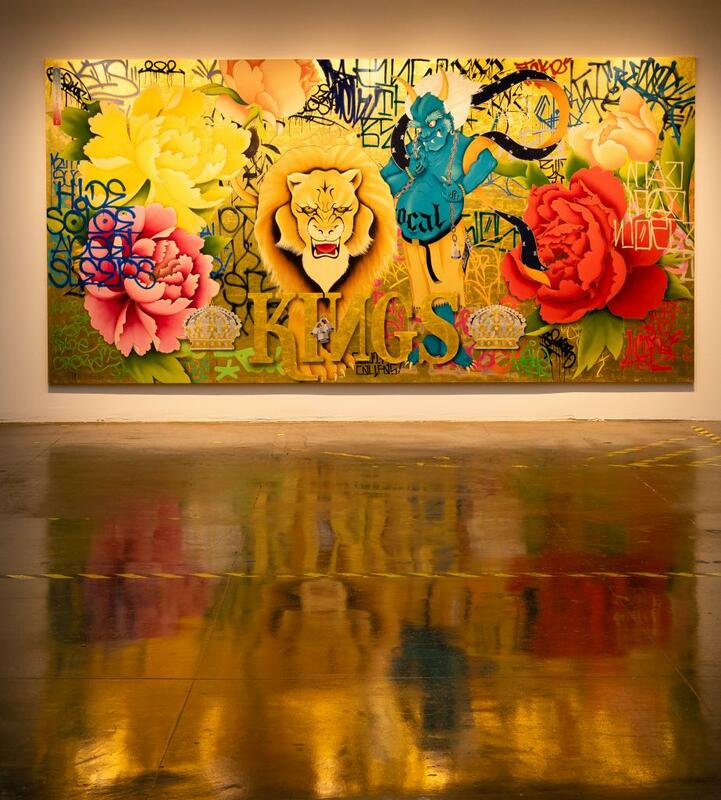 While Beyond the Streets is loosely associated with MOCA—in some ways, it’s a sequel to the museum’s 2011 exhibit, Art in the Streets, with which it shares a lead curator—the production of this show is independent. That’s allowed the team to do things that wouldn’t be possible in a typical museum show. The physical scale of the exhibit alone would make hosting it a challenge for anything but the world’s largest museums. 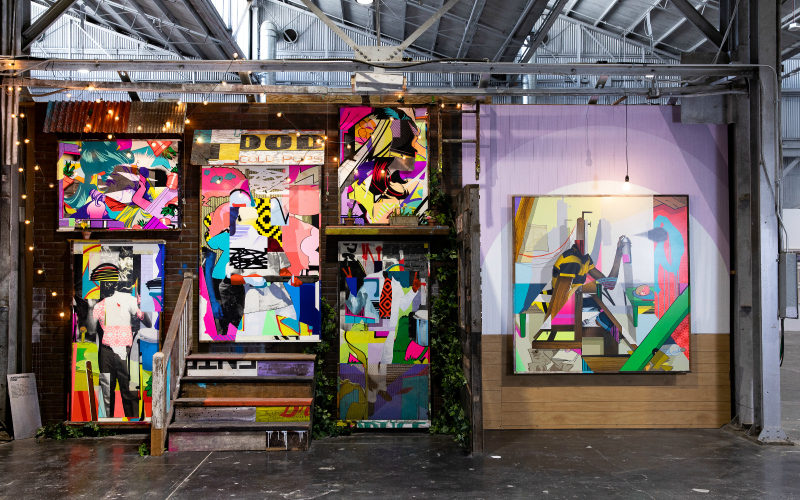 Beyond the Streets encompasses more than 40,000 square feet of a former industrial building, with indoor and outdoor components and multiple large-scale installations and environments. The organizers also eschewed the conventional museum practice of getting art on loan from third parties and private collections. Instead, they set out to source all the art directly from artists. While it might seem like a small matter to people outside the art world, it’s a big deal to curator Roger Gastman. It means that every piece that appears in the show is there with the enthusiastic support of the artists or their representatives, and is done in a way that respects the original context and intent of a genre of art that has at times walked a line between rebellion and mainstream respectability. Many pieces on display are by artists whose work has become part of permanent collections at museums around the world and who are widely accepted as being members of the fine-art canon—think Jean-Michel Basquiat or Jenny Holzer. But many of the creators on view started making their work outside of that context, whether they were tagging subway cars or wheat-pasting posters to construction barriers. They had something urgent to share with the world, and the canvas available to them was the streets. There are deep connections to Los Angeles in the show. An entire room is dedicated to Shepard Fairey, featuring a large mural wrapping around the walls, and a case filled with personal ephemera, art tools, and notes from the course of his career. Estevan Oriol’s now-famous photograph of a woman’s hands forming an overlapping L and A is presented here in three large, repeating prints—something Oriol probably didn’t foresee when, in 1995, the image was rejected by the magazine to which he’d submitted it because it was deemed “too gang-affiliated.” Next to Oriol’s work is an original mural by East L.A. artist Gajin Fujita, who’s developed a signature graffiti style that blends the urban imagery around him with the iconography of his Japanese-American heritage. 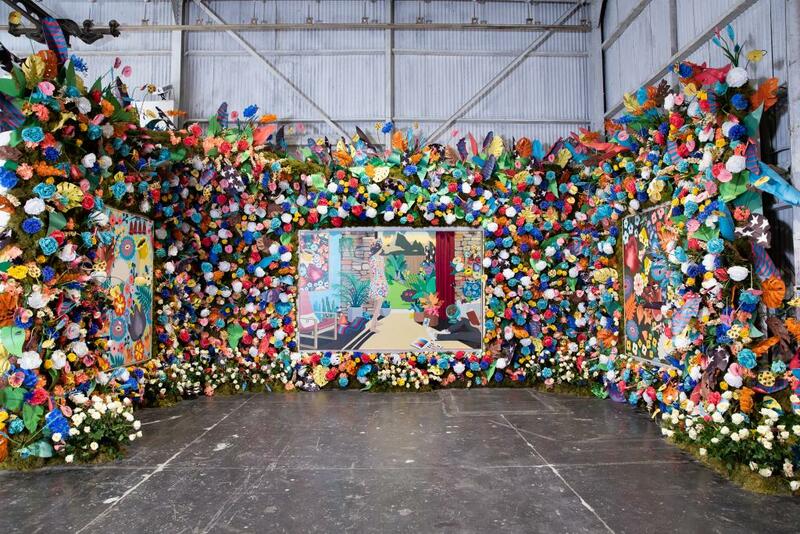 Elsewhere is a multimedia work combining painting, sculpture, and assemblage, created by the Echo Park-by-way-of-Cape Town muralist Faith XLVII. Lowrider culture figure Mister Cartoon designed a nearly full-size chapel, built into one portion of the gallery, complete with pews, religious texts of all kinds, paper flowers, and child-sized casket, covered in shimmering green candy paint and emblazoned with the phrase “All dawgs go to heaven.” Outside is a green space by “gangsta gardener” Ron Finley, who grew up in what he calls the “food prison” of South L.A. and made it his mission to combine art, activism, and urban farming with an innovative project that builds pop-up parks and gardens. 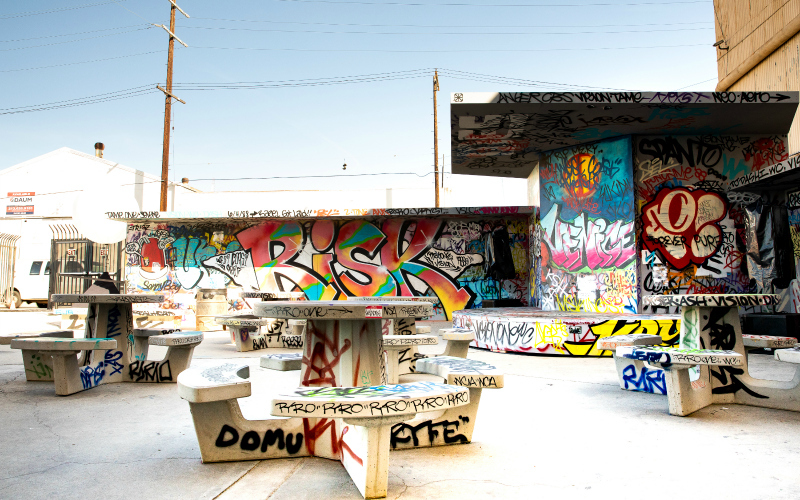 The back patio of the warehouse features adidas Skateboarding’s immersive recreation of the Venice Pavilion, which was a hot bed for skaters, punks, and Westside culture until it was demolished in 2000. 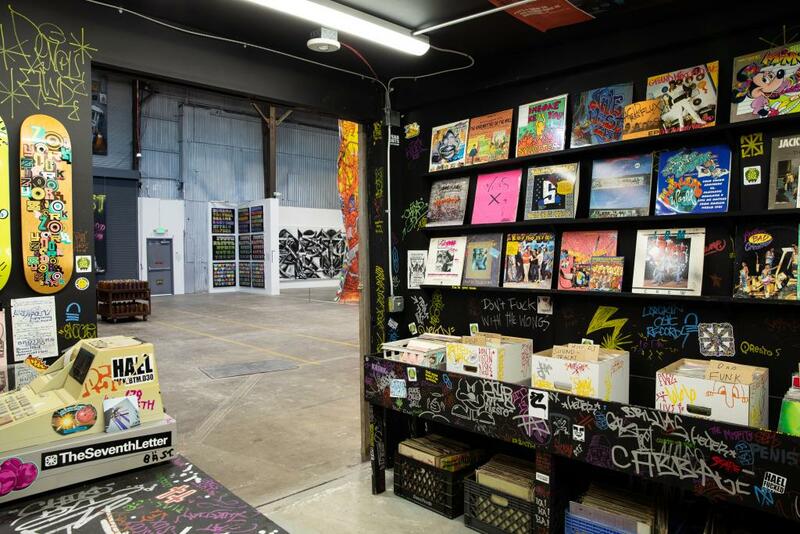 It’s shown here as it would have been in the 1980s, right down to tattered reprints of archival concert fliers from the era featuring the likes of Black Flag and Suicidal Tendencies, anti-Reagan protests, and colorful tags and markings, which were re-created for the exhibition by the graffiti artist RISK. In tribute to the original, the installation is fully functional and will host live skateboarders during the exhibition’s run. 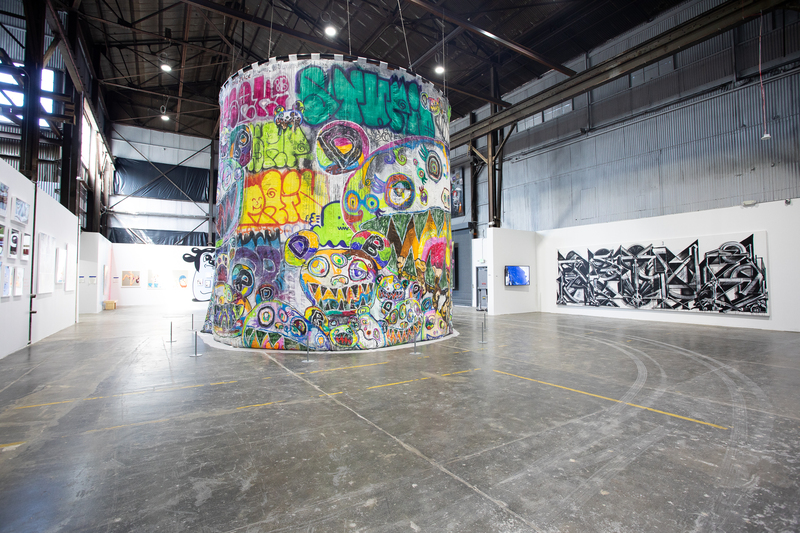 That blending of history lesson, artwork, and experiential environment may owe more to the pop-up Instagram-friendly “museums” that have proliferated than to a traditional fine art approach, but it also reflects what street art is: populist, accessible, and constantly changing as weather and human use of the surfaces wear away at the work in ways that can’t happen in a pristine gallery environment. Beyond the Streets runs from May 6 to July 6 at 1667 N. Main St., in Chinatown. After the Los Angeles run, the show is scheduled to go on display in New York City later this year. Advance tickets are required and are available for purchase online.